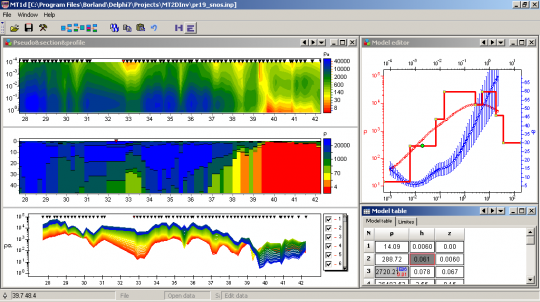 ZondMT1d software is designed for one-dimensional interpretation of magnetotelluric (MT) data in MT, AudioМТ and RadioMT frequencies ranges and also for soundings with controlled source. This group of electroprospecting methods is based on studying of the natural variable electromagnetic field, allows to study distribution of the Earth conductivity on depths from the first meters to many tens and hundreds kilometers. Investigating of distribution of resistivity with depth possible due to the phenomenon of skin-effect which defines the depth of electromagnetic field penetration vs frequency. 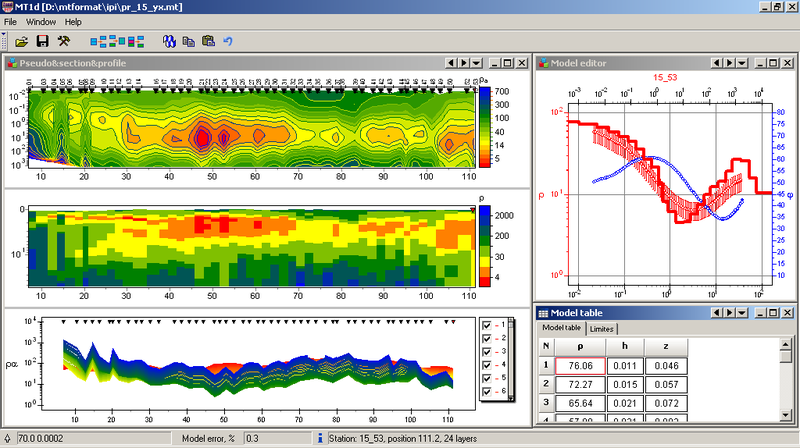 Thus, MT curves reflect change of resistivity vs depth. Comfortable interface and wide possibilities of data presentation allow to solve given geological problem with maximum effectiveness. While developing software special attention was paid to comfort and simplicity of its use, variety of visualization features and account of a priori data. Depending on the interpreter’s choice, software gives different variants of data interpretation algorithms. Comfortable control system allows to choose from the great number of equivalents results that will appear to be the best in geophysical and geological point of view. Conception of multi-station interpretation is basis of the ZondMT1D software. Consequently, profile line data is considered as a reflection of geological section. It’s mean that multi-station data of profile line is whole, and not set of separated curves. Special windowed algorithms developed for interpretation of profile line data are provided in the software with every curve P-effect’s reduction. But most software features can be used also during work with the separated points of MT. You can use areal XY survey with arbitrary lines orientation in multi-line mode. ZondMT1d uses simple and clear text format of data allowing to combine easily various systems of observation, including information on topography and other additional information. Also well-known formats of the data (Mackie, Rebocc, EDI, J) are supported. As the basic task of the program is inversion of geoelectric section parameters – few variants of inverse problem are realized in ZondMT1D, basic of them are: smoothed inversion – to get smooth, and focusing – to get the piece-smooth distributing of geoelectric parameters vs depth. Because of equivalence of inverse geophysical problems, quality of the obtained results strongly depends on the amount of used a priori data. In ZondMT1d there is possibility of weight setting (Error gates) for measurements, fixing and limiting of different layers parameters, using of a priori model as reference in inversion. If the values of some section parameters are known exactly (a priori or on interpretation results), their fixing is possible before the beginning of automatic interpretation. The fixed parameters do not change during the process of inversion. Fixing of parameters is the method for hard regularization of inversion process. The robust schemas of noise estimation are realized in the program. There is also possibility to import and display results of measurements by other methods and borehole data that can improve results.